ask us “What can I do to avoid violating Google's site policies?” We thought it would be useful to create a compact guide sharing some best practices on how some common site policy mistakes can be easily avoided. In the AdWords Site Policy Starter Guide we take a look at some of the most common site policy violations policies such as ‘bridge page’, parked domain, information harvesting and help you avoid some common pitfalls. We hope that this guide helps you better understand some of our site policies. 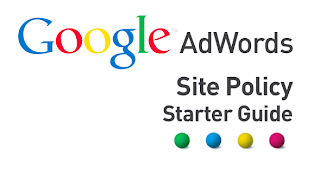 For more information on our site policies, please visit our AdWords Help Center. Quite often advertisers at conferences, or on the AdWords Community ask us “What can I do to avoid violating Google's site policies?” We thought it would be useful to create a compact guide sharing some best practices on how some common site policy mistakes can be easily avoided.